Shrink Wrap Machines For All Output Levels! Machines Built For All-Day Usage! A full line of parts are available for all machines we offer! Shrink wrap machine is a common term used in the packaging industry. When properly used, a shrink wrap machine is referring to a machine used in heat shrink packaging that includes a sealer and heat source to apply heat to the shrink wrap. People also often use the term shrink wrap machine when describing pallet stretch wrap machines which can be found here. The shrink wrap machine sealer is used to close open ends of the shrink film and the heat source applies heat to the film to shrink it down to the product being wrapped. Low output operations often use a heat gun as the heat source. In our blog post, What Shrink Wrap Machine is Best for Your business, we explain ideal shrink wrap machines based on the level of forecasted production. It is an excellent source for people new to shrink wrap packaging to begin with. Our shrink wrap machines come to us from multiple reputable manufacturers. There are multiple types and sizes to choose from. Currently online we only list our smaller machines for low to medium output operations. We offer a large selection of fully automatic machines for high output operations. Feel free to call us and inquire about any of our high output shrink wrap machines. *I-Bar Sealers- A great option for anyone using shrink bags or shrink tubing. I-Bar sealers offer one sealing bar toseal and cut the shrink film in one motion. Our I-Bar shrink wrap systems come with everything needed to begin shrink wrapping your products. Our portable I-Bar sealers offer a detachable sealing bar to quickly and efficiently seal products. Instead of moving the products to the sealing bar, users can move the sealing bar to the products. All portable I-Bar sealers come with a 8' chord to allow easy and efficient adjustment of the sealing bar. *L-Bar Sealers- Great for any type of shrink film we offer. L-Bar sealers have three sealing bars designed to makesealing centerfold shrink film easy and efficient. All of the L-Bar sealers listed online are considered manual shrink wrap sealers for low to medium output operations. Call us to inquire about semi-automatic and fully automatic L-Bar sealers. *Shrink Wrap Systems- Put together for beginner operations that are starting off with low output. Our shrink wrap systems are cost effective and come with everything needed to get started shrink wrapping products. The shrink wrap system is different than the I-bar shrink wrap system because difference in the sealers. *Hand Impulse Sealers- Recommended for low output operations that are sealing 10 items or less per hour. Hand impulse sealers come in two varieties of machines. Round wire sealers and flat wire sealers. The flat wire sealers are more affordable, but do not seal and cut in one motion. The round wire sealers cost more, but are more efficient because of the ability to seal and cut in one motion. 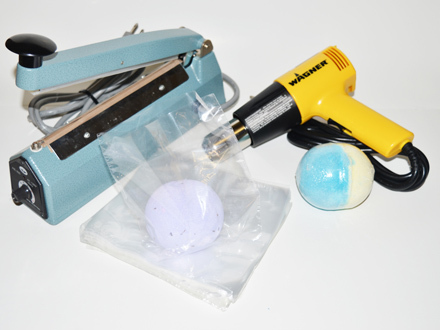 *Shrink Wrap Heat Guns- Currently we only offer two shrink wrap heat guns online. They are both great for low output operations. The difference is the temperature control. The two-speed heat gun only offers two adjustable speeds and the variable temp heat gun offers an adjustable knob for multiple heat settings. We also offer a large selection of shrink tunnels for higher output operations. Call us to inquire about any shrink tunnels you may be looking for. *Shrink Tunnels- Ideal from medium to high speed output operations. Shrink tunnels come in a variety of sizes and dimensions. Shrink tunnels substantially speed up shrink wrapping production. We recommend anyone wrapping more than 150 products per day to consider purchasing a shrink tunnel. *Foot Sealers- An excellent option for wrapping shrink bags and poly bags high speed. We offer two types of foot sealers in a variety of widths. The regular foot operated sealers come with a flat sealing wire. The flat sealing wire does not seal and cut the film in one motion. They are an excellent option for poly bags. For shrink bags we recommend our round wire foot sealers. The round wire allows users to seal and cut shrink shrink bags in one motion. *Shrink Wrapping Combo Systems- L bar sealer and shrink tunnel combinations are made for packaging thousands of products daily. Combo systems can come with many different options. Magnetic hold down is an option that keeps the L bar sealer in sealing position until the seal is complete. This allows users to grab the next product while the seal finishes. A discharge conveyor is another option that transports products into the shrink tunnel. This option also saves time because users do not have to touch the product after the initial seal. Shrink combo systems save time and increase efficiency. *Conveyors- Conveyors come in many different forms, shapes, and varieties. The primary conveyors used for shrink wrapping are gravity feed conveyors. They are used at the exit of a shrink wrap tunnel to catch finished products. Fully automatic shrink wrap machines have powered feed conveyors to continually feed products into the shrink wrap machine. Knowing the dimensions and weight of the products being wrapped is essential in choosing the right conveyor. Different conveyors are made to transport different product shapes and sizes. If you do not see a specific shrink wrap machine you are looking for, click on the live chat button, visit our contact us page, or call our toll free number at 1-800-441-5090. One of our sales associates will do their best to assist you with what you are looking for. Angel Hair - Thin strands of shrink film on the edges by the seal that can be caused by a variety of issues. Centerfold Shrink Film - A shrink film folded length ways and placed on a roll. Chamber Size - Referring to a shrink tunnel, the chamber is the size of the interior heated area. Contactor - Electrical relay used to engage heaters, sealers, or blowing fans on a variety of shrink machines. Control Panel - The main operating panel for a sealer or shrink tunnel often consisting of temperature control, conveyor speed, shrink time, seal time, and more. Discharge Conveyor - A conveyor belt between an L Bar sealer used to transport sealed products to a shrink tunnel. Entry Conveyor - A mechanically driven product transportation device used to move products into a fully automatic shrink wrap machine. Exit Conveyor - A mechanically or gravity driven product transportation device used to move products from a semi-automatic or fully automatic shrink wrap machine. Film Build Up - The build up of black film residue on a sealer after multiple seals. Film Rack - A film holder used to dispense film for shrink wrapping, sealing, and other applications. Film Separator - A device used to separate centerfold shrink film before sealing and shrinking. I Bar Sealer - A machine consisting of one heated side used to seal off and enclose products within a flexible plastic film. Impulse Sealer - A smaller I Bar sealer often used for low production sealing. Infrared Shrink Tunnel - A form of shrink tunnel often consisting of multiple infrared heating tubes used heat the inside of the tunnel. L Bar Sealer - A machine consisting of two heated sides used to seal off and enclose products within a flexible plastic film. Magnetic Hold - A locking mechanism using magnets to hold down a sealing bar until a seal is completed. Mesh Belt - A gridded wire belt overlay placed on conveyor roller rods to prevent smaller products from slipping between individual rollers. Micro Knife/Band Ribbon - A newer form of sealing element found below sealing bars used to replace sealing wires. Band ribbons are often attached to the main frame of the machine below the sealing bar. Band ribbons are often thicker and capable of sealing and cutting many more products before replacement is necessary. Pinwheel Perforator - A wheel shaped object with sharp points often placed close to the film rack to insert small holes into shrink film. The small holes allow air to escape the sealed package when heat is applied. Power Film Unwind - A motorized sealer feature designed to easily unwind film from the carriage for easier use. Recirculating Shrink Tunnel - A form of shrink tunnel using fans to continuously blow heat within the shrink tunnel. Roller Rods - Rotating rods often Teflon coated placed on a conveyor chain to transport products through a shrink tunnel. Seal Time - A specified time set to complete a seal on flexible plastic materials. Sealing Bar - The top bar on an L Bar sealer or I bar sealer, lowered down to create a seal on flexible plastic film. Sealing Wire - A heated wire element found on the sealing bar used to apply heat to create a seal on flexible plastic. Sealing wires are available in flat and round wires. The flat wire sealing wires only seal film and are capable of obtaining thicker, stronger seals. Round wire sealers seal and cut excess film. Shrink Chamber - A fully enclosed seal and shrink wrapping machine that fills with hot air for a specified time after a seal is completed. Shrink Time - A specified time set to apply heat to a shrink film to obtain the proper shrink rate. Shrink Tunnel - A heating element commonly used with shrink wrapping, consisting of a conveyor moving products through a heated area to shrink film. Single Wound Shrink Film - A flat shrink film placed on a roll. Steam Shrink Tunnel - A form of shrink tunnel using steam to heat the inside of a tunnel. Teflon Tape - A PTFE extruded tape with a chemical resistant surface. Often placed over sealing wires to reduce film build-up directly on the sealing wire. Transit Chanel - A ceramic channel used to hold band ribbons in place.